The Stroudwater and the Thames and Severn Canals traverse some of the most beautiful parts of the English countryside, rich in mills and flowing water for the once prosperous woollen industry. 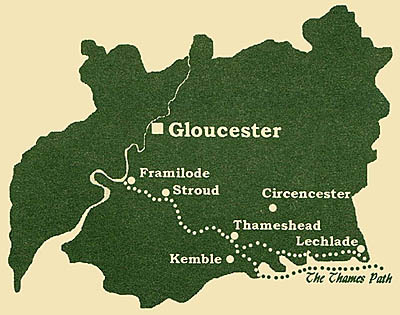 From Framilode on the River Severn, the Stroudwater Navigation runs up to the Cotswold edge via Eastington, Ebley and Wallbridge. From Stroud the Thames and Severn Canal rises through the spectaular Golden Valley to the summit and the 2 miles long Sapperton Tunnel, for many years the longest canal tunnel in Britain. Descending through open countryside to Cirencester and the Thames Valley the canal joins the Thames, or Isis, at Inglesham close to Lechlade. Although much of the eastern part is inaccessible nearby field paths provide a satisfactory alternative. The Stoudwater Canal was promoted by clothiers in the Stroud valleys mainly to obtain coal more cheaply from Shropshire, Staffordshire and the Forest of Dean. It was completed in 1779 and climbed from the Severn via 12 locks in 8 miles. Still owned by the 'Company of Proprietors of the Stroudwater Navigation', it is the oldest privately owned canal in Europe. The Thames and Severn Canal was later conceived to connect the two great rivers of England, the Severn and Thames. Engineered by Robert Whitworth with 44 locks in the 29 miles between the Stroudwater at Wallbridge and Inglesham lock into the Thames.